We’d love your help. Let us know what’s wrong with this preview of The American Spirit by David McCullough. To ask other readers questions about The American Spirit, please sign up. Who are some of the great Americans mentioned in the book? Nettie Very amusing......a few of these people I detest and have no interest.......but Donald Trump....MAGA! Thank you, David McCullough, for writing this book. I appreciated the inspiration and optimism when the state of the world seems especially bleak. The American Spirit is a wonderful collection of speeches McCullough has given over the years. If you aren't familiar with his work, McCullough is an American historian who has written some excellent books, including John Adams, Truman, 1776 and The Wright Brothers. In an interview with Time magazine, McCullough said he decided to publish this book in Thank you, David McCullough, for writing this book. I appreciated the inspiration and optimism when the state of the world seems especially bleak. Yes, we have much to be seriously concerned about, much that needs to be corrected, improved, or dispensed with. But the vitality and creative energy, the fundamental decency, the tolerance and insistence on truth, and the good-heartedness of the American people are still there plainly. Read books. Try to understand the reason why things happen, why they are as they are. If you see only the surface phenomena, then the world becomes extremely confusing, ever more unsettling. But if the reasons are understood there's a kind of simplicity that emerges. Sometime, somewhere along the line, memorize a poem. Sometime, somewhere along the line, go out in a field and paint a picture, for your own pleasure. Sometime, somewhere along the line, buy your father a good bottle of New York state wine, write your mother a letter. And sometime, somewhere along the line, do something for your country. So on you go. If your experience is anything like mine, the most important books in your life you have still to read. And read you will. Read for pleasure. Read to enlarge your lives. Read history, read biography, learn from the lives of others. Read Marcus Aurelius and Yeats. Read Cervantes and soon; don't wait until you're past fifty as I did. Read Emerson and Willa Cather, Flannery O'Connor and Langston Hughes. The world needs you. There is large work to be done, good work, and you can make a difference. Whatever your life work, take it seriously and enjoy it. I listened to this book on audio, which I highly recommend because McCullough has a fantastic reading voice. (I also listened to him read Truman, which was a delight.) My only quibble is that McCullough sometimes repeats the same stories, which is understandable because this is a collection of speeches, and naturally he's going to return to some of the same themes when he regularly addresses college students. This book is short enough that I read it in one sitting, so the recurrence was noticeable. But I liked this book so much that I'll happily forgive the repetition. If you are new to McCullough, this book would be a nice introduction because he shares good stories from several of his previous works, including anecdotes about Harry Truman, John Adams and Thomas Jefferson. I thoroughly enjoyed The American Spirit and am grateful for the dose of optimism. 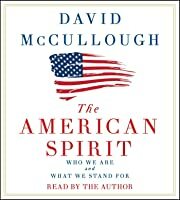 “The American Spirit” is a collection of speeches given by historian David McCullough, beginning in 1989 and ending in 2016. Like all such collections, it has its hits and some lesser moments. I will not call any of them misses, as I found value in all of them. Some highlights of the collection include “Which Way Forward”, a commencement speech McCullough gave at Union College in 1994. If only the advice he gave that generation, (my generation) was followed. His encouragements to read, have a moral backbone, be generous, etc. are not groundbreaking, until a generation practices them. Then they change the world. “The Animating Spirit”, a speech he gave about Founding Father Dr. Benjamin Rush serves to increase one’s admiration of America’s founding generation. What extraordinary humans they were, and McCullough correctly celebrates them. In moments like these McCullough is doing what he does best, and doing it well. In “What’s Essential is Invisible” McCullough writes a thoughtful and insightful overview of presidential power and then follows it up with examples and historical tidbits about those who have held the office. The speech “Knowing Who We Are” should be taught in every American school. In this 2005 speech, McCullough gives us the reason for the ignorant state of many US college graduates that we find to be the case nowadays. In addition, this speech makes clear why the letters of Abigail Adams should be part of every American Civics course. Unfortunately, the final speech in this collection, “A Bridge like No Other” is rather weak. McCullough takes some subtle cheap political shots in it, which is why I think the piece fell flat for me. One of my pet peeves is the arrogance of the current generations when they regard those who came before them. McCullough writes, “We’ve got to teach history and nurture history and encourage history because it’s an antidote to the hubris of the present-the idea that everything we have and everything we do and everything we think is the ultimate, the best.” When I read things like that, I am happy, and all I can say is YES YES YES! A collection of some of David McCullough’s speeches, given at graduations, events, citizenship ceremonies over the years. By their nature, these are individually not overly long, and easily read, about America and what it means to be an American, and the lessons and legacies of our ancestors through history. From the Introduction on, McCullough shares his thoughts and feelings about these days we are in, and how easy it can be to feel a bit down about the ways things are, but also that in looking at our collective past as a guideline for our future, we may examine what to keep and enhance and what to abolish for the sake of all. We are, after all, a country built on a foundation of diversity, and that fact should be embraced for what it offers us both now and for the future, from the young to the old, the dreamers to the farmers to the teachers and influencers, writers, musicians and dancers, spiritual leaders and political leaders and those protesting injustices. In his address to the University of Pittsburgh in 1994, he speaks of a program that has been talked about repeatedly, but remains at a standstill, and why understanding its history is crucial to finding the solution. He quotes from a letter written to John Quincy Adams by his mother, Abigail, when he was an eleven-year-old boy as he embarked on a journey during winter, across the Atlantic, in the middle of a war. McCullough immerses the reader in a view of our country, our world, our future built on valor, wisdom, morals, perspective, hope, and compassion. His ability to bring history to life for all seems to fall into a category of a blessing for those readers, for his inspiration, enthusiasm, and optimism for our future is both unmistakable and contagious. Not quite three years ago, I read McCullough’s ‘The Wright Brothers’ and loved his ability to keep me engaged in historical non-fiction. I was every bit as engaged while reading ”The American Spirit: Who We Are and What We Stand For,” and it seemed like it just might be the perfect book to read around the Fourth of July, or any other time, for that matter. Fantastic, of course. The best way to read this book is by listening to the audio version. McCullough has the most amazing voice! My daughter recently sent me a clipping from the Memorial Day weekend Wall Street Journal opinion page. It was a piece by Peggy Noonan titled "Why History Will Repay Your Love", and it was her review of historian David McCullough's new book, "The American Spirit". This short volume is a collection of some of his speeches from the last couple of decades, most of them graduation addresses. McCullough, now in his eighties, is a Pulitzer Prize winning writer, an American treasure who is much honored My daughter recently sent me a clipping from the Memorial Day weekend Wall Street Journal opinion page. It was a piece by Peggy Noonan titled "Why History Will Repay Your Love", and it was her review of historian David McCullough's new book, "The American Spirit". This short volume is a collection of some of his speeches from the last couple of decades, most of them graduation addresses. McCullough, now in his eighties, is a Pulitzer Prize winning writer, an American treasure who is much honored and loved. Any of the books he has written are well worth the read, with this one being no exception. I listened to the Audible version, which he recorded, and hearing the author read his own work was an additional treat. If you've never read anything by David McCullough, start with this appetizer. Otherwise, this is dessert. Enjoy! "Never forget that one of the greatest of our freedoms is the freedom to think for yourself" ~ DAVID MCcULLOUGH, "The Bulwork of Freedom," Ohio University 2004. The internet, and by turns - the world, America being no exception, is flush with a plethora of information, misinformation, truths, half-truths, doom, gloom, sensationalism, misnomers, misconceptions, falsehoods, and flat-out lies. To believe everything one reads is to despair of all hope; network news isn't known for accurate, balanced "Never forget that one of the greatest of our freedoms is the freedom to think for yourself" ~ DAVID MCcULLOUGH, "The Bulwork of Freedom," Ohio University 2004. The internet, and by turns - the world, America being no exception, is flush with a plethora of information, misinformation, truths, half-truths, doom, gloom, sensationalism, misnomers, misconceptions, falsehoods, and flat-out lies. To believe everything one reads is to despair of all hope; network news isn't known for accurate, balanced reporting. It would be easy, then, to think that all the "Good" days have come and gone. But revered historian and author David McCullough presents a compelling argument to the contrary as made evident through his many speeches within this composition. "When bad news is riding high and despair is in fashion, when loud mouths and corruption seem to own center stage, when some keep crying that the country is going to the dogs, remember . . . 90 percent, or more, of the people are good people, generous-hearted, law-abiding, good citizens who get to work on time, do a good job, love their country, pay their taxes, care about their neighbors, care about their children's education, and believe rightly, as you do, in the ideals upon which our way of life is founded." ~ DAVID MCCULLOUGH, "The Bulwork of Freedom," Ohio University 2004. The United States of America is one of the greatest nations in the world. Compared to a great number of countries, we have an abundance of prosperity, first-rate infrastructure, widespread freedoms, vast assets, work place privileges and steady productivity, life longevity, vast recreational opportunities too numerous to count, natural resources, a world class military.... The list goes on. But it seems that many young people, and perhaps, people from generation X onward, have forgotten just how good we have it here. They (really, everyone of us) need a healthy reminder. "The laws we live by, the freedoms we enjoy, the institutions we take for granted - and we should never take for granted - are all the work of others who went before us. And to be indifferent to that isn't just to be ignorant, it's to be rude. And ingratitude is a shabby failing." ~ DAVID MCCLLOUGH, "Knowing Who we Are," Hillsdale College, Hillsdale Michigan 2005. More than just a reminder of who we are, and what we stand for, as Americans, this book also celebrates history, reading, learning, dreaming, desiring to make the world a better place because we took the time to serve others and care about our fellow travelers. Learning is not to be found on a printout. It's not on call at the touch of the finger. Learning is acquired mainly from books, and most readily from great books. And from teachers, and the more learned and emphatic the better. And from work, concentrated work." DAVID MCCULLOUGH, "The Love of Learning," Boston College 2008. I could write on and on about this collection of speeches written and orated by one of the most revered American historians. Truly though, what 'words' could I really offer that wouldn't be far better said and served by simply reading the book yourself? Please Do. Read it. READ READ READ . . . Not just this book, but all great books that helps us all to be better people - better Americans - better citizens of the world. I was disappointed by this book because I was hoping for more analysis and insight. However my disappointment is really my own fault because I didn't pay enough attention to its description. This book is a collection of the author's speeches presented at graduations, citizenship ceremonies, event celebrations, etc. These speeches, by their nature, are short and shallow. They also devote a lot of time to flattering the audience and praising local historical figures. I didn't realize what "The American Spirit" was about really when I picked it up but David McCullough is one of my very favorite historians and he is definitely on my automatic read list. This book is filled with speeches that the author has given everywhere from in front of Congress to commencement speeches in front of college students. This book is filled with inspiration and stories of parts of American history that it was good to be reminded of as well as stories that I was unfamiliar with. I didn't realize what "The American Spirit" was about really when I picked it up but David McCullough is one of my very favorite historians and he is definitely on my automatic read list. This book is filled with speeches that the author has given everywhere from in front of Congress to commencement speeches in front of college students. This book is filled with inspiration and stories of parts of American history that it was good to be reminded of as well as stories that I was unfamiliar with. I devoured this little book by America's distinguished historian. He shares speeches he made between 1989 and 2016. So much wit and wisdom. Everybody ought to read this. These two simple instructions inform this selection of McCullough's past speeches, and they convey quite a grand message - albeit an unassuming one. Speech collections are not at all my thing unless they're the words of people who have already passed. David McCullough is still thankfully alive and continuing to work, so while his words have great impact, they have likely only begun to shape our thoughts. Many of these speeches were given at colleges, while the rest happened on t Read. Read history. Many of these speeches were given at colleges, while the rest happened on the occasion of important historical anniversaries in the United States. The speaker's interests are clear, and one of the most fun aspects of reading these speeches in a volume was seeing the influences of his other works. John and Abigail Adams are frequently referenced, their words used as examples and lessons. Similarly, McCullough spends a good deal of time in one speech talking about the Americans who spent time in Paris and who fill the pages of his book, The Greater Journey. While there's a chance these speeches may come off as random, they most certainly are not. McCullough uses pieces of the past to help us understand the present and to hopefully inspire the future. Clearly in these trying political times the United States is facing an identity crisis. If anything, America has become a divisive country of minorities of all political, racial, sociological and economic backgrounds without much respect towards those on the opposite side of the spectrum. Can't we all work as a whole once again and use our differences as a strength instead of a barrier to progress? Time will tell. The rise of Trumpianism will probably be remembered as a dark stain in western civ Clearly in these trying political times the United States is facing an identity crisis. If anything, America has become a divisive country of minorities of all political, racial, sociological and economic backgrounds without much respect towards those on the opposite side of the spectrum. Can't we all work as a whole once again and use our differences as a strength instead of a barrier to progress? Time will tell. The rise of Trumpianism will probably be remembered as a dark stain in western civilization, much like Stalinism left everlasting ripple effects on Russian society. 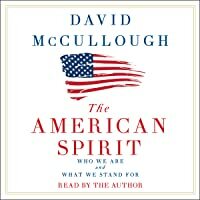 However, instead of dwelling in despair, these historical times offer us a chance to reexamine who we are, where we come from, and where we want to go as an American people, and David McCullough's collection of speeches entitled The American Spirit helps to do just that. McCullough, like Doris Kearns Goodwin or Ron Chernow, is a central pillar of American historical perspective, and nobody better deserves our attention in examining contemporary American political thought. Anyone familiar with McCullough's work will notice he traverses familiar territory contained in his past books, examining John and Abigail Adams, Harry Truman, Theodore Roosevelt and the Panama Canal, and the lasting impression the city of Paris had on many famous Americans from all walks of life among other examples. Encased among these speeches are grand nuggets of wisdom from these influential people that really help showcase just how significant the United States is and continues to be as the ultimate social and political experiment. Take this for example: "What is so difficult for many today to understand is that in the 1950s the United States was neither rich nor a military power. The army stood twenty-sixth in the world in strength, behind Switzerland and Argentina. And a good 40 percent of all the families in America were living on incomes of less than a thousand dollars a year." (pg. 73) Those facts alone are extraordinary considering the power of both the economy and military the US has represented in such a short amount of time. This is a really charming collection of McCullough’s speeches. Most were given at college or university commencements. They aren’t provocative or necessarily even thought-provoking. The author is more affirming, than critical, of American ideals. But given the lack of any real unifying principles in American intellectual and political life, this collection is timely. A collection of inspiring speeches by the greatest living biographer, David McCullough. Excellent collection of speeches given to graduates, houses of Congress, and other institutions and groups. This slim volume has pictures in some chapters, and each chapter can be read alone. My knowledge of American history and related topics has certainly been updated by reading what McCullough has chosen to share in this book. I recommend it to all readers. Fantastic! If you enjoy David McCullough this book is a gem. Beautifully designed, with photo images, this volume contains some of McCullough's best speeches. I read this on the plane trip back from Washington DC and to me it summed up our experience beautifully. So many nuggets of American wisdom and sentiment. A couple of the speeches ("Knowing Who We Are" and "The Love of Learning") is worth the price of the book. This one is going on the night stand. 5 plus. David McCullough's compilation of some of his speeches, many given at college commencements, so moved me that I gave a copy to everyone at Mother's Day brunch. "Mom! Why are you giving everyone presents on Mother's Day?!" 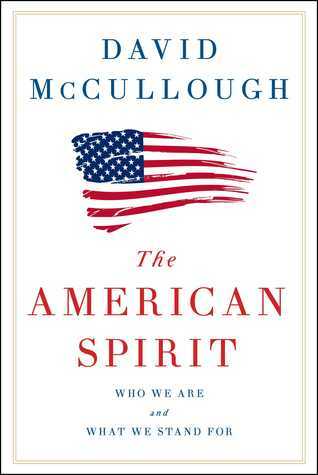 I simply wanted to spread the palpable optimism and obvious faith in the American Spirit (and his aptly titled book) that can be found on almost every page of McCullough's beautiful written book. And who thought history could be so interesting? To say McCullough is a national treasure would be an understatement. As the preeminent voice on many of American history’s greatest legends, in my opinion, reading his speeches that pull wisdom from our past exemplifies exactly what a writer should be able to do. Like many of the speeches and texts he pulls from, McCullough writes in a memorable and at times “call-to-action” manner. A lovely, quick read based in the tenacity of the American spirit. Summary: A collection of addresses given by the author articulating some of the defining and distinctive qualities that define America at its best. David McCullough has been one of those authors whose books I always make a point to pick up whenever a new one comes out. I was tempted to make an exception with this one, not usually being drawn to read transcripts of speeches. When I found it at a good discount, I took the plunge and I am glad I did. The thread that links these speeches, given betwee Summary: A collection of addresses given by the author articulating some of the defining and distinctive qualities that define America at its best. The thread that links these speeches, given between 1989 and 2016 is what truly makes America great. McCullough would contend that it is the people and the democratic ideas and ideals and the working out of these, that have defined our greatness. He assembled this collection during the contentious presidential race of 2016, and it is striking that he bookends the collection with speeches discussing the history of congress, and the Capitol building where it does its work. He highlights the distinguished figures who inhabited those halls from John Quincy Adams, former president and ardent anti-slavery advocate to Margaret Chase Smith, who in her first term stood up to Joseph McCarthy, and landmark legislation including the Morrill Land Grant Act establishing public tertiary education in the growing post-Civil War nation. McCullough highlights the collaboration across the political aisle that marked great legislative accomplishments, a challenge to both of our political parties. "Read. Read, read! Read the classics of American literature that you've never opened. Read your country's history. How can we profess to love our country and take no interest in its history? Read into the history of Greece and Rome. Read about the great turning points in the history of science and medicine and ideas. Read for pleasure to be sure. I adore a good thriller or a first rate murder mystery. But take seriously--read closely--books that have stood the test of time. Study a masterpiece, take it apart, study its architecture, its vocabulary, its intent. Underline, make notes in the margins, and after a few years, go back and read it again (pp. 147-148)." "Religion, morality, and knowledge being necessary to good government and the happiness of mankind, schools and means of education shall be forever encouraged." While McCullough refrains from overt criticism either of Congress or the White House, his narrative of the people and ideas that have "made America great" stands as an implicit challenge both to our leaders and to us as citizens, first to understand the ideas and ideals that have distinguished us at our best, and then to live up to them rather than depart from them. McCullough will probably be known as one of the greatest historians of the modern time. This book is a compilation of various speeches McCullough has given over the years. Most were at commencement speeches to various colleges. They combine his love of history, with an understanding of the men, women, and events that have shaped our country to form a hopeful view of the future. Reading this book in the political climate of the Trump presidency is kind of interesting. McCullough is talking ab McCullough will probably be known as one of the greatest historians of the modern time. This book is a compilation of various speeches McCullough has given over the years. Most were at commencement speeches to various colleges. They combine his love of history, with an understanding of the men, women, and events that have shaped our country to form a hopeful view of the future. Reading this book in the political climate of the Trump presidency is kind of interesting. McCullough is talking about what makes America great; the drive forward, the can-do attitude and the perseverance. Most of these speeches were written in the mid 90’s. McCullough thinks that sometimes we give too much weight to who is President. He comments how Congress is the real political powerhouse because they are a group of people, for the people. Presidencies boiled down leave only the potency of language. McCullough does also go on to say that some men were president in a perfect time for their skill sets. Sometimes joining or avoiding a war often comes down to the President, and how their actions reflect on all of America. Since some of these speeches were to graduating college students McCullough wants them to be lifelong students. “We are what we read." He comments how we need to know how we got where we are. We must know where we came from. We need to study our history. Not just as a nation but even our families. No one is a self-made man, no one got to where they are without some kind of help. Find the help, be the help. Beautiful little book of David McCullough’s speeches that read like great short stories. It’s like having many private conversations with Mr. McCullough where he shares his most favorite, amazing bits of history. An enjoyable collection of speeches given by David McCullough. Lots to glean in regards to how we best love, serve and honor our country. One action point: read history. I think this was a fantastic book! Sooo many good points and great facts about America. Anyone can and should read this! He talks so much about Abigail Adams in this... I wonder if he is thinking of doing a biography on her. What an amazing and wise woman. 1/3 of college graduates read less than 1 book a year.